Also known as “I cant’ read a recipe’ stew! I found a recipe for what they called ‘Italian Chili’ in a magazine. It sounded delish, I bought the ingredients, thought I knew what I was doing and started cooking. After I was beyond the point of no return, I realized that I had totally messed up the recipe, but didn’t want to waste the food, so I just carried on with what I thought would be good. I took some things from that original recipe and added others and ended up with something that my whole family raves about. It’s easily doubled and will feed a crowd. 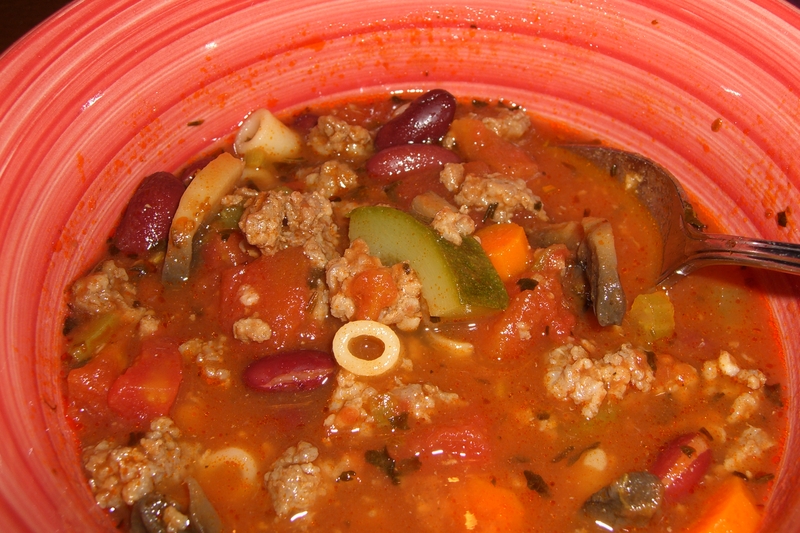 It’s hearty and flavorful and freezes well, all requirements in my kitchen. Serve it with some crusty bread and your family and friends will think you’re a genius! 1. Cook ground beef and Italian sausage with onion and garlic until browned. Drain. 2. In a large pot, add tomatoes, tomato sauce, beef broth, seasoning, meat mixture and all veggies EXCEPT ZUCCHINI, cook on medium heat until stew is bubbling. Simmer on low/med heat covered for 2 hours. 3. 20 to 30 minutes before you’re ready to eat, add the zucchini (if you add it too early, it will be completely mush when you’re ready to eat). 4. in a small pan, bring 3C water to a boil and add the dittalini, cook until only partially done. Drain and add to the stew, it will finish cooking in the pot with everything else. 5. Serve with crusty bread and a nice dark red wine! A wonderful meal on a cold winter evening. I love happy accidents and it look great too! This happen to me a lot. If I am short on something I substitute it with something else. Or add too much or less of an ingredient. Thank goodness there are many ways to cook one dish! Thanks! It really is delicious and hearty. And yes, i do that many times like you do, sub one ingredient for another that I run out of or don’t have.